Taking a Break Might Be More PRODUCTIVE Than You Originally Thought! Constantly working can take a toll on your cognition, resulting in mental fatigue. 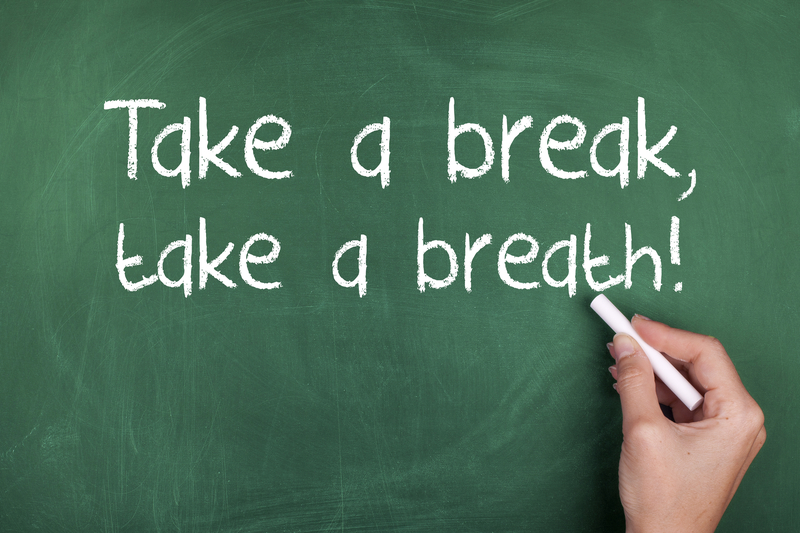 Taking a break for a few minutes will improve your concentration and help you focus better. You will be able to spot mistakes or problems much easier as a result of the break. It’s been observed that sleep improves a person’s memory. While nap rooms may not be available in every office, taking a 10-minute nap at your desk can re-boot your system. Nap breaks have been observed to have a positive impact on employees’ cognitive functioning. Meditation, walking, reading and a host of other activities have been observed to boost grey cell performance. By taking frequent breaks, you may get new ideas and perspectives about the work you are doing. Considering how breaks improve concentration, creativity, and memory, it is easy to see how when combined, they are the ingredients to working more effectively and efficiently. Simple stretching and walking can get your blood circulation going. It can also help you lose weight. A person needs to walk approximately 10,000 steps to keep himself/herself healthy. Interspersing regular walk breaks in-between your work will help you relax and burn those calories. Do you have your lunch at your desk? It’s time to stop doing so. Your brain uses the time you take for lunch to repair the overused neurons by absorbing the nutrients from the food you consume. When you take a long lunch break, you give your brain a chance to recuperate and re-energize itself for the work yet to come. Taking frequent breaks energizes your body and mind and makes you more alert. When you are able to focus better, you will be able to spot potential threats to life or limb. Most accidents in the workplace are a result of extreme work-related stress, which can be combated by taking breaks regularly. Whether you choose to take a walk or decide to use your fidget cube during the break, you are sure to find yourself more relaxed. Breaks give you the opportunity to step back from work and take a breather. Break time is often a time for social interaction. Something as simple as a tea or coffee break may help you meet people who may be important cogs in the organizational machinery. If not, you’ll at least get to have a cup of joe with a friend. Jonathan got his start through an Advertising agency. He began in the production department and eventually worked his way up to managing a small team. He then decided to make a transfer over to sales, and over the course of a year built a book of business valued at north of $2.5MM a /year in revenue. Jonathan was given the opportunity to manage a team on this end as well (combination of junior account executives and sales reps) in bringing in new business, monetizing existing business, and growing revenue streams to their full potential. Later, he left the agency to form his own company as a financial intermediary, helping small businesses attain necessary funding during hard times. More recently, Jonathan has founded his own management consulting firm A.K.A. Furman Transformation, igniting his full passion in transforming all aspects of a company’s Sales, Marketing, and Operational Growth strategies, into the most powerful and polished version of themselves. How to BOOST your energy in 20 minutes or less!